Kathmandu Durbar Squares largest and most important temple sits behind a large walled enclosure in the northern section. The three-storey temple sits on top of twelth brick plinths or pflatforms which towers over the area. The temple itself is behind a locked gate which is only opened up for one day every year during the dashain festival (ninth day). All visitors inbetween can only gaze upon it from outside the walls. The temple suffered some roof damage in the 2015 earthquake but has since been completely repaired. A little known fact is that there are acutally three Taleju temples in Kathmandu. One in Bhaktapur Durbar Square and one in Patan Durbar square. The Taleju goddess originally came from south India but was adopted by the Malla kings who built temples to her. 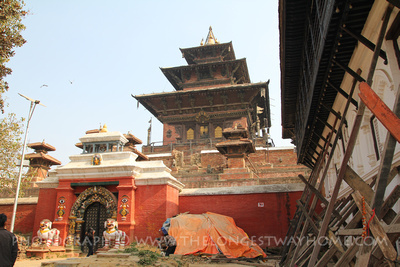 The Taleju temple in Kathmandu Durbar Square is not the oldest! It is the most important but the oldest is the Taleju temple in Bhaktapur which was built in the 14th century. 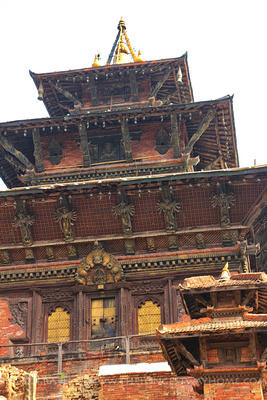 The Kathmandu Taleju temple was built in 1564 by King Mahendra Malla. As you may know the Malla kings of the Kathmandu Valley had an artisic and physical rivalery so all three cities have a Taleju temple. The Taleju temple that you see today is mainly the result of additional work carried by King Pratap Mall who is known as the most artistic of all the Malla kings. The Kathmandu Taleju temple temple was modeled on the shape of a yantra, a form of mandala or a mystical diagram with magical powers. This idea came from the Hindu Goddess Taleju Bhawani herself. When the temple was opened Taleju Bhawani made a special appearance, one of the few gods every to be noted for doing so. That aid the . Goddess Taleju showed up disguised as a bee! It is forbidden for any building to be constucted that is taller than the Taleju building. A point that creates a lof contention in Kathmandu city today. In 2015 the temple roof was slightly damaged in the earthquake. However repairs were carried out an completed in 2016 along with some renovation. The Taleju temple can only be visited once a year by Hindus on the ninth day of the Dashain festival. For everyone else you can only look at it from outside the walls and gates that surround it. If you do visit it on this day, do be warned that there are often animal sacrifices around the area then. Inside there are 12 miniature versions of the temple that surround the main building. There are four more temples higher up just below the main temple. The four main decorative gates are guarded by stone lions. Inside the main Taleju temple itself are golden statues depicting the ten-armed Goddess along with shrines to both Taleju Bhawani and the Kumari, Nepal’s Living Goddess. The Hindu Goddess Taleju Bhawani was also the clan Goddess of the Malla kings who ruled Nepal from the 12th to the 18th century. There is no entrance fee to visit the Taleju temple as it comes under the general fee for Kathmandu Durbar Square. 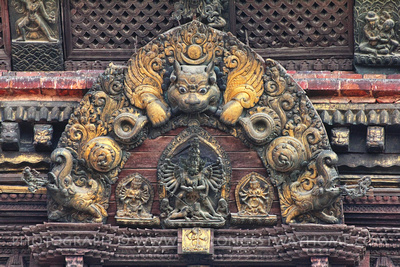 The Taleju Temple in Kathmandu is located on the northern part of Kathmandu Durbar Square near Hamuman Doka. By walking: Kathmandu Durbar Square is an easy is 20 minute walk from Thamel. Do take care along the streets along the way as they are broken and often very busy. Motorbikes zoom around at speed. By taxi: Unless you are staying far from Thamel taking a taxi durbar square can be slow and annoying. Prices will be above average for this route from Thamel 150-200rps. Better to tell them to drop you at New Road which borders the square 100-120rps. Do a heritage walk on the way! If you plan on walking to the Taleju temple or Kathmandu Durbar Square from Thamel then do consider a Kathmandu city heritage walk which will show you much of the beautiful old city along the way. Looking for more things to do in Kathmandu? Check out this list of things to do in Kathmandu and this full travel guide Kathmandu city. Liked this page? You'll love my guidebook! It's a guidebook that's better than the rest. Yes, really! In it I cover all of Kathmandu's real and hidden attractions with well researched information, photographs and travel tested walking tours including old city heritage walks and Durbar Square. It's an interactive & printable guidebook like no other.